I've mentioned many times that I put off scrapping vacations in favor of easier layouts that involve fewer pictures. 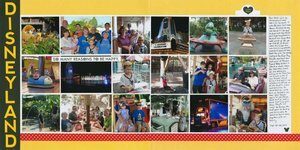 In the spirit of going back and trying to get caught up, here is the layout from our family trip to Disneyland in 2015. I know exactly why I put off vacation layouts, but the question is what to do about it. I wonder if I should jump ahead and take care of our most recent trip first and work back. On the other hand, it is extremely satisfying to fill a gap in an older album and remove a post-it note. What do you do? Any hints or tricks? You know me, I am ALL over the place when I scrap - so I am probably the last person to offer advice!! LOL!! I loveeeeeeeeeee this! LOVING the colors and the photos!!!!!!!!!! Love a photo-filled double page spread! P/s: I work on the most recent trips first (this year) and then work back. I find that printing the photos out forces me to work on them. Hi Cindy! I love the way you scrapped all of your photos from your Disney trip back in 2015! I always scrap out of order - I just scrap what my mood strikes me that morning! So I love that you went out of order! I really like how you scrapped all of these fun-filled pictures. To me, this is what scrapping is all about!